Search giant Google has added India to the list of countries where it is offering 'Indoor maps'. For those who don't already know, Indoor maps enables users to view and navigate floor plans of several commercial locations such as airports, shopping malls, large retail stores, transit stations, and more within Google Maps. To begin with, the company is offering floor plans of 75 locations in 22 cities across the country. These include Bangalore, Bhopal, Chennai, Coimbatore, Chandigarh, Dehradun, Delhi, Ghaziabad, Goa, Gurgaon, Hyderabad, Jaipur, Kochi, Kolkata, Lucknow, Ludhiana, Moradabad, Mumbai, Noida, Pune, Raipur, and Vadodara. Apart from shopping centres, the floor plans are also available for locations like museums (National Gallery Of Modern Art, Delhi and Salar jung, Hyderabad) as well as convention centers (Hyderabad International Convention Center), among others. 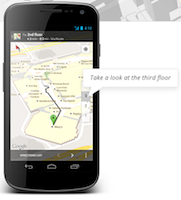 "We launched indoor maps in countries like the US earlier. Now we are bringing it to India. We worked with mall owners and authorities that manage a place to get the floor plans and location details and have added that information to Google Maps," Suren Ruhela, director and product manager, India Google Maps, told Times of India. He further mentioned that while the company is starting with 75 places, as it gets feedback from consumers and works with more partners, it will add even more places going forward. In total, Indoor maps currently offers over 10,000 floor plans from 19 countries including the US, the UK, Russia, Australia, Japan, Italy, and India, among others. Here is an introductory video of the service. The indoor floor plans are seamlessly integrated into Google Maps for desktop, Android & iOS, and are automatically enabled when the user zooms in, and fade away when the map is zoomed out. Note that Android and iOS users will need to update their map app to access the new feature. To find an available Indoor maps location, users can simply zoom into the map until you start to see an indoor floor plan of the building. While the feature will make use of several techniques to find the location of the user, the most important one will be the smartphone's ability to look for Wi-Fi. "The indoor maps feature would work best when a user has the Wi-Fi scanning option turned on in the phone. For this feature the phone only needs to scan for networks and doesn't necessarily have to connect to them," said Ruhela. You can use the level switcher to move from the ground floor to other available floors in the building, and depending on the data available, the map will show notable places in the building you are currently viewing, including stores, restrooms, food, and more. In addition, users can search Indoor maps, but the search results won't show unless you have fully zoomed into a building where an indoor map is available. Searching works just like it does in the rest of Google Maps for mobile. Recently, Google had also partnered with the Archaeological Survey of India to bring 360 degree views of Indian monuments on Google Maps.